Greetings from National Council of Churches in India. Human rights activists are campaigning to have nation-wide observation of "Kandhamal Day" to ensure justice to the victims of the sectarian violence that took place six years ago. The communal violence that started on Aug. 25, 2008 lasted for almost three months and killed hundreds of people, mostly Christians. There have been more than 3,300 complaints, but only 820 odd FIRs were registered. The rest of the complaints were not even registered. Of these complaints, only 518 cases were charge sheeted. The remaining cases were treated as false reports. And out of these 518 cases, 247 cases were disposed off. 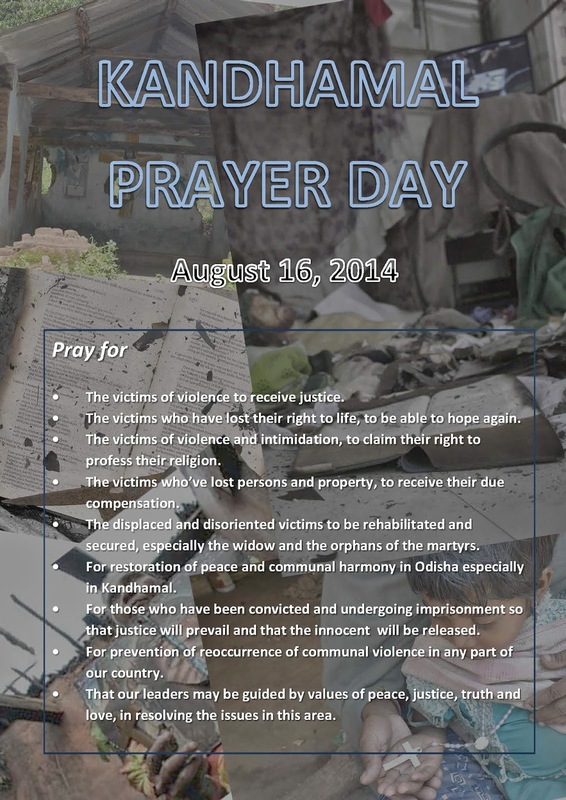 The Utkal Christian Council of the National Council of Churches in India, has proposed observing August 16, 2014 as prayer day related to the Kandhamal persecution of Christians. The Council has been closely accompanying the victims of Kandhamal in their struggle for justice. On August 16, 2014 the Utkal Christian Council is inviting all leaders of Churches and organizations to a mega prayer summit at Happy Valley Home, Badenaju, Gudayagiri – 762100 to be held from 9:00 AM to 3:00 PM along with believers in the Kandhamal area. We can make it a National Prayer day along with Utkal Christian Council. As Christians, Church bodies and concerned organizations, besides our ongoing campaigns and advocacy efforts in this area, we need to uphold the affected people in prayer with the faith that justice and peace may be restored. This will be an expression of unity and solidarity while also calling upon the authorities to render justice to the Christians of Kandhamal and to ensure the constitutional rights of Christians for freedom of worship as well as their security. The victims of violence to receive justice. The victims who have lost their right to life, to be able to hope again. The victims of violence and intimidation, to claim their right to profess their religion. The victims who’ve lost persons and property, to receive their due compensation. The displaced and disoriented victims to be rehabilitated and secured, especially the widow and the orphans of the martyrs. For restoration of peace and communal harmony in Odisha especially in Kandhamal. For those who have been convicted and undergoing imprisonment so that justice will prevail and that the innocent will be released. For prevention of reoccurrence of communal violence in any part of our country. That our leaders may be guided by values of peace, justice, truth and love, in resolving the issues in this area. We hope that we may all be able to organize meetings in our Churches, organizations and institutions, to stand up in prayer with united hearts and minds which we believe to be a great force in making our supplications heard, and which unpacks the blessings of sharing in God’s plan for restoration and revival.